SmartWatch™ monitors and adjusts the hatching process automatically from the day of transfer through to the last chicks hatching, eliminating any need for human intervention. SmartWatch™ is an important feature of SmartHatchPro™. The module finely controls ventilation in the hatcher based on a programmable CO2-setpoint, from the moment of transfer to the moment of chick take-off. The valve position is gradually increased throughout the hatching process, avoiding the risk of excessive ventilation. This supports a natural increase in relative humidity as the chicks emerge from their shells, creating ideal conditions for a shorter hatch window. Eventually relative humidity reaches its peak and starts to decline again as the chicks are drying. Field trials have proven that >95 % of chicks will have hatched between an increase of relative humidity over set point, to a 3% decline from peak humidity: the so called ‘hatch peak’. With the ability to measure the hatch peak so precisely, Pas Reform has developed the most reliable estimation of the hatch window in the industry. 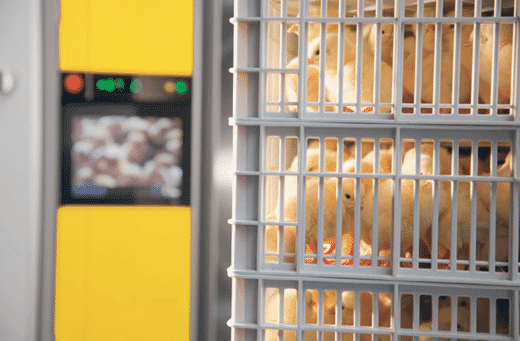 When the chicks have dried 8 hours after the decline of relative humidity (programmable between 6 – 12 hours) - a “hatch alert” flashes on the screen of SmartTouch™ to indicate, without opening the door of the hatcher, that the chicks are ready for pulling. This hatch alert can be used subsequently to fine-tune the setting time for future hatches, to ensure that chicks need never spend more time in the hatcher than necessary, or be pulled too early so that too many wet or unhatched chicks remain in the basket. Because SmartWatch™ is fully responsive to CO2 levels in the hatcher, it delivers a more reliable, accurate hatcher climate than can be achieved by manual operation or with the use of time-fixed set point changes, optimising the all-important hatch window to contribute to a healthy, vital hatch - every time.